Center’d, the service that looks to help you figure out what to do with your day, has released a new iPhone application that lets you tap into the site’s restaurant, event, and activity recommendation engine on the go. The application is free and you can grab it here. Center’d competes with sites like Yelp and CitySearch, but instead of simply offering text reviews, the service scours the web for reviews and descriptions and performs semantic analysis on them, allowing you to perform more detailed searches than you could on other sites. In my testing I found the app’s manual search mode, which lets you search by keywords, to be pretty hit-or-miss. During one search for “large portions” Center’d pulled up a list of matching restaurants, but the app didn’t do a good job explaining why it thought they had large portions (you’d expect it to display any relevant text in its database, but it didn’t). In fact, when I looked through the details of the top hit for “large portions”, that restaurant’s top keyword was “small plates”. Go figure. Search leaves something to be desired, but that doesn’t mean the app isn’t worth checking out. Its City Guides functionality, which lets you search using a number of pre-set filters, is actually quite helpful. To use it, you first choose a description of what you’re looking for (options include things like ‘Kid-friendly’, ‘Romantic’, and ‘Outdoors’). Then you choose the type of venue you’re looking for, be it a restaurant, event, shopping or attraction. The app pulls up a list of matches, and for the most part I found these to be pretty accurate — a search for kid-friendly restaurants in Palo Alto pulled up local favorite ‘The Creamery’ as the top result, and the app also made it easy to pull up a list of local bars with outdoor patios. 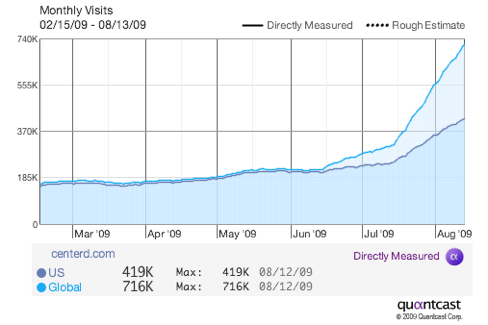 Aside from the iPhone app, Center’d is seeing strong growth, though its traffic is still pretty modest. Since April the service has doubled its traffic. Also worth checking out is Yelp’s new iPhone application, which includes deals from local merchants.